The Johnson Wheelbarrows 6 Cu Ft 88 Lb Wheelbarrow will transport load across any terrain. 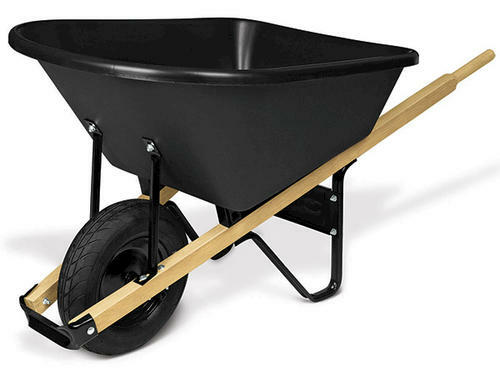 The durable 88 lb wheelbarrow can carry a level capacity of up to 5 cubic feet and a heaped capacity of 6 cubic feet. The rounded nose is designed for easy dumping and has a 16 tray gauge. Transport and dump your load conveniently with the Johnson Wheelbarrows 6 Cu Ft Wheelbarrow.